For South African wine regions, the 2010 vintage was a year of highly variable extremes of weather. A mild Spring was followed by a cool period in early Summer, and, with strong winds a consistent factor over much of the growing season, the combination of weather factors caused yields to be lower than usual. Favourable weather from mid-Summer through to harvest time, however, has produced a vintage of very high quality, esp. in Stellenbosch with the lower yield resulting in wines of high concentration and intensity. 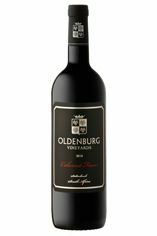 This South African Cabernet Franc offers intense notes of perfume, violets and herbs on the nose, complimented by subtle oak spiciness. Firm, grippy tannins support the fruit to add wonderful complexity and length on the palate. Flavours of black berries and plums linger on the finish. Matured 15 months in French oak barrels, 25% new. It’s rare to find a wine made from 100% Cabernet Franc outside the Loire Valley; more often, the varietal is used as a component in Bordeaux-style blends. Here, however, one could almost argue that this 100% Cabernet Franc is the finest red wine in the Oldenburg portfolio.